Investing in good quality clothes is a career commitment that pays off, but those well-made clothes need a little TLC to keep their lines crisp and the cuffs looking smart. Set-in stains can be the single biggest cause for discarding otherwise good clothing. So, the experts at Woolite are here to fill you in on tackling stains so you can keep your wardrobe looking like new and lasting longer. It’s important to treat stains as quickly as possible before they have a chance to set in. If you can’t treat it immediately, at least do your best to blot up as much of the stain-causing material as possible, and then treat it when you get home. It’s all in the approach. While your instinct may be to go at that stain with gusto, resist the urge. Rubbing a stain will often just set it in deeper. Instead, take a gentler approach by blotting at the stain with a clean cloth or towel to absorb as much liquid as you can. Keep a variety of detergents and solvents like mild laundry soap, ammonia, vinegar, laundry stain spray and bleach on hand to treat the many kinds of stains you may encounter. Refer to Better Homes & Gardens’ thorough Guide to Stain Removal Products for the best treatments for a variety of stains. 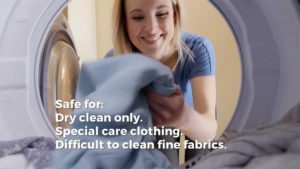 The chemicals used in professional dry cleaning are widely effective at removing stains from a variety of fabrics and leathers. 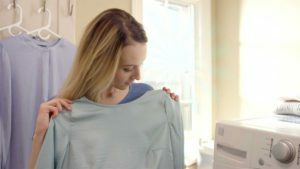 These are also available for home use through products like Woolite® At-Home Dry Cleaner, which includes OUT Instant Stain Remover wipes for spot-treating stains before dry cleaning. So, go ahead and invest in quality wardrobe pieces and career-wear. With a little know-how, you can keep them looking good for years!